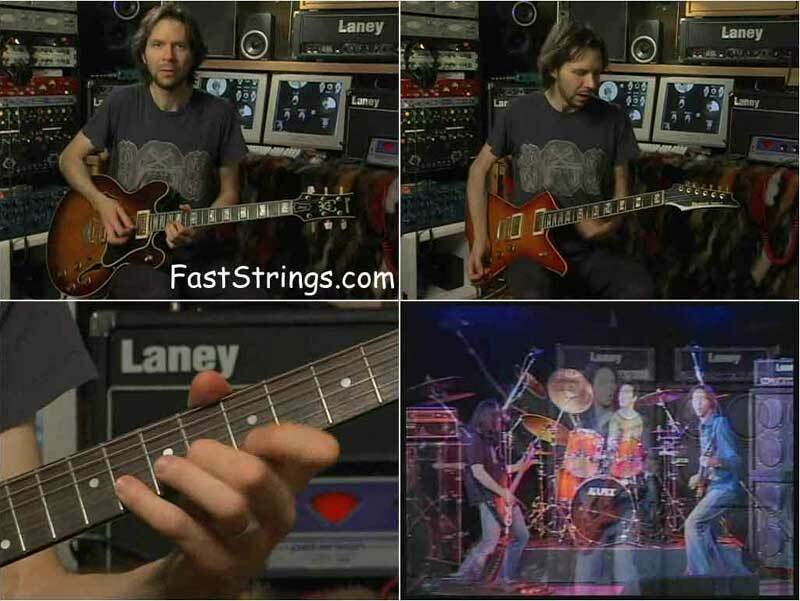 Paul Gilbert Get Out Of My Yard Instructional DVD download. With G3 featuring Joe Satriani and John Petrucci, Paul Gilbert presents his amazing, brand new DVD containing over two hours of personal guitar instruction and live performances from the world’s most insane shred guitarist. WARNING: Your Playing May Never Be The Same!!! Over 2 hours of the most intense shred you’ve ever seen in your life! Every song, yes, EVERY song from the Get Out of My Yard (GOMY) album is covered highlighting the main sections of each song. Only downside is there’s no on-screen tab and no tab booklet included, but the closeups on Paul’s fingers are great and you should have no trouble following along. Awesome live performances of some songs from GOMY after the lesson section and even technique is covered (hammer-ons/pull-offs, arpeggios, alternate picking). He breaks every single thing he does down to the super basics. He shows you how he got to that idea, how he plays it and how you could go about it. Paul learned by ear and plays by ear which makes him a different type of teacher, he brings in a different approach. This DVD not for beginners unless your a really big fan of his or if you really like the CD “Get Out of My Yard” or one of the songs on it. You’ll get an inside look into these songs. He gives practice tips and goes into things in detail. It feels like Paul is giving you guitar lessons which is awesome! All in all because most of the DVD is geared around his CD and more specifically to playing fast I would say this DVD is best used as a learning tool. However, he does provide you with some excellent information in his explanations and teachings so you will pick up more than just how to play fast but it is not geared for that. By combining this DVD with others and some books you can go far. As an example: This DVD, Chord Chemistry, Chord Progressions by Ted Greene, Fretboard Logic volumes and other lessons here and there.